We are stoked to be listed as among the best museums in Singapore by Time Out Singapore! Here’s what they said about us, “But good things come to those who wait, and we rejoiced when the doors of South-East Asia’s first-ever natural history museum were finally flung open once again”. So come visit the Singapore sperm whale, our three towering Jurassic dinosaur fossils, and learn about the rich biodiversity in Southeast Asia. After that, share what you think after your visit. Do leave us a review on TripAdvisor or our Facebook page. We appreciate the feedback given by our guests. The Straits Times created an infographic of the Singapore sperm whale that explains more about the way of life of this majestic creature, and what the museum discovered about her. Sperm whales are one of the most capable divers of all mammals. How do they cope with the pressure, and find their food? Explore the infographic and check out the exhibit starting 15 Mar 2016 at the museum! The commonly eaten flower crab or swimming crab actually comprises 4 species. These crabs that were all formerly known as Portunus pelagicus are now A) Portunus pelagicus, B) P. segnis, C) P. reticulatus, and D) P. armatus. Photo by Joelle Lai. 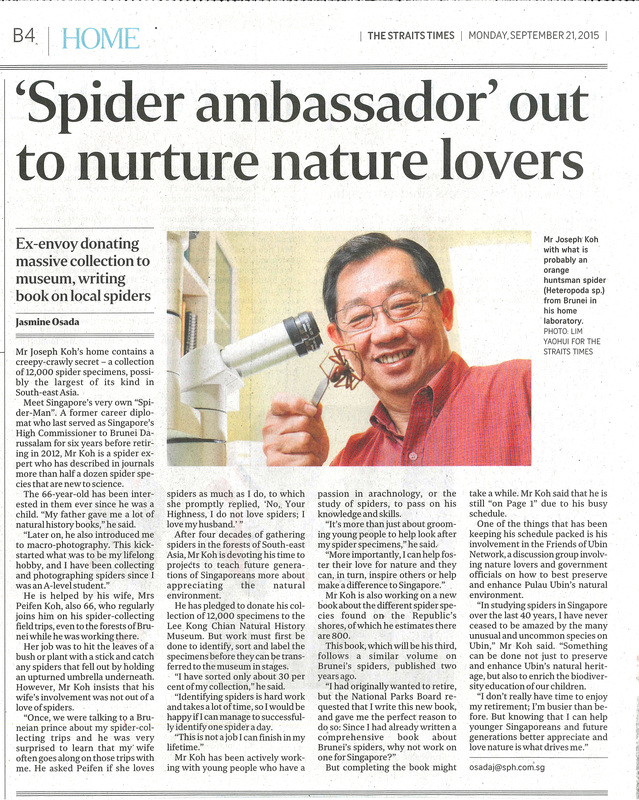 This research finding recently featured on The Straits Times was published in the Raffles Bulletin of Zoology in 2010 by museum staff Dr Joelle Lai, Prof Peter Ng and Dr Peter Davie of the Queensland Museum. It shows the importance of biodiversity research and its applications in the management of commercial fisheries, particularly of the concern about over-harvesting. Read the original research paper here: A Revision of the Portunus pelagicus (Linnaeus, 1758) species complex (Crustacea: Brachyura: Portunidae), with the recognition of four species.